I am all about director boxsets. There’s something intimidating about the exploration required to engage in completionist cinephilia, where you endeavour to see every single picture a director filmed, so it’s a relief to simply plonk a box down on your shelf and set yourself a more manageable goal, rather than scurrying around the outskirts of the internet or the dusty corners of second-hand video stores for that obscure sophomore release. So I couldn’t help myself when Madman Entertainment recently released Jacques Tati’s entire filmography as a Blu-Ray (and DVD) boxset. I’d only seen one Tati film before purchasing Jacques Tati: The Restored Collection, but that film – Tati’s fourth feature, Playtime – was one of the key films in shifting my appreciation of cinema from “movie fan” towards “cinephilia” (they’re pretty much the same thing, only the latter is more wanky). The first film in the set is Tati’s feature length debut, Jour de Fête (or The Big Day), which is presented in an impressive three different versions: the black-and-white 1949 original, a 1964 cut which includes some extra scenes and colour hand-painted (by Tati himself!) and a 1995 colour restoration. I watched the 1964 version, which to my eyes looked slightly crisper than the 1949 transfer, but this could have just been my imagination. The colourised sequences are clearly distinct from the black-and-white footage, possessing a dull aqua hue that is, thankfully, not particularly distracting. The 1995 cut looks awful in comparison – it’s a lower resolution transfer with obvious scratches, muck and muddy colour marring the picture throughout (I can understand why the same restoration effort wouldn’t have been directed towards the “colourised version,” given the poor reputation of colourisation amongst cinephiles, but given the film was originally filmed in Thomson-color, it’s disappointing). The film is, like all of Tati’s work, an essentially plotless comedy. Jour de Fête observes as a carnival takes over a small town, but doesn’t really come into its own until its last half, when postman François (Tati himself) watches a humorously hyperbolic reel of his American counterparts postal service (a trick played on him by the condescending villagers). The extended sequence where François begins delivering mail “American style” is defined by precise physical comedy – those bicycle stunts! – and is a joy to watch. Tati’s second film, Les Vacances de Monsieur Hulot (or Mr Hulot’s Holiday), demonstrates Tati’s increasing confidence as director. 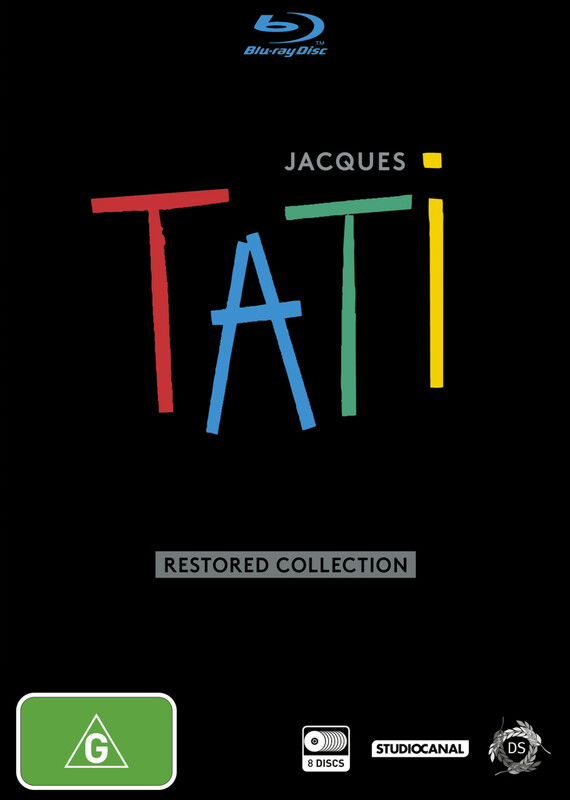 Included in two versions – the original 1953 and the 1978 restoration (which I watched) – Tati’s skill with commanding compositions has become quite apparent. I was reminded of a film that would be released a year later – Hitchcock’s Rear Window – in the way an entire community is developed and observed. This observation mostly gives birth to jokes – some remarkably clever ones, demonstrative of both considered wit and, again, impressive physical comedy. The paint tin sequence, the card game, the changing tire all made me wish I could’ve seen the film with a live audience: occasionally the matter-of-factness of the jokes plays a little dry when watched by yourself. The only scene that really fell flat for me was the tennis scene, which only has a weak connection to how tennis games work (specifically, why does Hulot always serve?) but seems to be a fan favourite regardless. The sound design is impeccable, as is a common feature of Tati’s oeuvre. His films are often compared to silent cinema, and the influence is undeniable. Yet he’s able to create and sustain an atmosphere so effectively thanks to his use of sound – and more besides. The way music is used to drown out a political speech on the radio is effective metatextual observation on Tati’s films, how he balances his comedic surface with subtle social commentary bubbling underneath. That social commentary more often than not revolves around the increasing role of technology, and that’s especially evident in Mon Oncle (packaged here alongside My Uncle, an English version of the film – as you might have gathered, this boxset is catnip for completionists). That commentary is mostly channelled through “house of the future” that forms the centrepiece of the film and provides both a source of gags as fancy new garage doors and stovetops prove perilously defective. There’s class commentary here too – note who does, and who doesn’t warrant a greeting with a jet of the dolphin fountain – and subtle observations of societal expectation, with Monsieur Hulot struggling to navigate the deviously inconvenient geometric paths his bourgeois contemporaries cross effortlessly. Tati’s compositions don’t direct your eye – you’re encouraged to survey the screen – but this is fitting given his setpieces revolve around things seen and unseen. Many gags are built around things the audiences sees coming but the characters do not (eg walking into poles) or vice versa (Hulot using a window to make a songbird sing). The emphasis on transparency in the innovative set designs is both prescient with respect to the growing role of technology and necessary aesthetically; his observational approach requires a geometry that can both conceal and reveal with equivalent ease. I hasten to emphasise that this isn’t as cool and removed as it might sound – the final scenes of Mon Oncle, spent watching dogs from a distance, are imbued with an inexplicable warmth. Playtime is a masterpiece, the perfect culmination of Tati’s career. It ruined him financially, with its absurdly expensive sets, but even if he’d never made another film again this one film would’ve been sufficient to preserve his legacy. All those elements I was just talking about – social commentary, reflections on technology and modernity, gorgeous compositions, transparency, etc – combine into a faultless whole. The consensus on the presentation of technology in Playtime is that the film is deeply sceptical of the growing role of technology. That’s certainly true – and watching these films from start to finish makes it impossible to miss Tati’s distrust of contemporary tech – but let’s not forget how creatively he conveys this message, how beautiful he makes all this look. As Monsieur Hulot tries and fails to navigate Playtime’s concrete-and-glass labyrinths, the images we see are singularly striking. Yes, we understand the message – that technology is a double-edged sword, making our lives harder as much as it makes them easier. But only someone with an eye for architecture and form – a true artist – could make what could have been nightmarishly ugly look this good. Tati’s follow-up, Trafic, could only be regarded as a “lesser” film when directly compared with Playtime. It’s not quite a masterpiece, but it is a fantastic work of art. Following an innovative new “camping car” on its ill-fated journey from Paris to an Amsterdam car show, the film feels in many ways like a retrospective on his career. There’s the stopover in the small town to collect fuel recalling Jour de Fête, or a tire-changing scene that reminds us of a similar scene in Les Vacances de Monsieur Hulot. The chaotic car factory – where Hulot is employed as designer – is analogous to the chaotic hose factory of Mon Oncle, while the auto-show itself recalls both the airport and trade show of Playtime. Then again, perhaps I’m simply seeing things after watching a whole bunch of Tati in a row. Trafic was not as impressive as opening scenes led me to expect, as the film trades the confident sense of space synonymous with Tati’s work for a structure more reliant on narrative, following Hulot’s stewardship of an innovative camping car from Paris to Amsterdam. The road trip structure lends itself to greater diversity than the earlier films – a good thing, arguably – but less of the stylistic consistency and amazing sets – understandable given the financial failure of Playtime. There’s some amazing setpiecs here, no doubt – the vine trellis, the autoshop, the car itself – hell, the scale of the unfurnished auto show is breathtaking all by itself, and we end with a genuinely magnificent final shot. Trafic is a poignant summation of Tati’s career, but it was not his final feature film. That achievement goes to 1974’s Parade, which I found relatively disappointing. Working with a vastly reduced budget – filmed direct for television – the film alternates between ugly, grubby video footage and occasional snippets of sharp 35 mm footage in its portrayal of a circus show lead by Mr Tati himself. The way the colour pops in the 35 mm is strikingly beautiful; it’s such a shame that the majority was filmed on video. The lack of visual fidelity combined with the inability to provide those trademark striking compositions means this is naturally going to be evaluated on a different set of criteria to the rest of Tati’s filmography. Still, the way he establishes his players and finds music in unexpected objects – paint tins and balloons – feels of a piece with his earlier works; without the ability to demonstrate creativity through the setting, he builds upon his use of sound and physical comedy. The film cleverly plays with the distinction between audience member and performer, but never feels on the same level as the films that preceded it. Nonetheless, it’s a potent demonstration that an artist like Tati doesn’t need million dollar sets to capture your imagination (but they sure don’t hurt). Okay, as we’ve established, I love director boxsets, particularly ones as extensive and inclusive as this one. It is worth pointing out that the big decision to consider when weighing up Jacques Tati: The Restored Collection is that there is some competition – if you’re in possession of a region-switchable Blu-Ray player at least. I’m talking specifically about the upcoming Criterion release, and generally when it comes to the decision between an Australian Blu-Ray and a Criterion alternative, the latter is the way to go. I’m not so sure that’s the case here. For one thing, the special features for the Madman Tati set and its Criterion equivalent are pretty analogous. Each includes all of Tati’s shorts – On demande une brute, Gai Dimanche, Saigne ton gauche, L’École des facteurs, Cours du soir, Dégustation maison, Forza Bastiai – and the aforementioned range of options for each feature film. Criterion’s laundry list of special features is a bit longer – and the packaging a bit more appealing, if that matters – but Madman’s options is pretty impressive in of itself (even before we get into the fact that it’s a local release and substantially cheaper). Each feature comes with from a half hour to an hour of analytical films from Stéphanie Goudet, all ported over from the StudioCanal release (and, weirdly enough, not mentioned on the external packaging). In fact, this set is pretty much a direct port of said StudioCanal set – right down to your language options being “France” or “United Kingdom” – with the notable exception that it includes the feature-length documentary The Magnificent Tati (something the Criterion set can’t boast). Personally, I’d recommend this set – my only real qualms are with the poor quality of the 1995 colour version of Jour de Fête (and there’s a good chance that’ll be true of the Criterion release as well) and the stock-standard packaging – the latter being quite irrelevant once the disc is actually in your player. The films contained within are a unique bunch, and it’s well worth immersing yourself in the intricate chaos of Jacques Tati’s universe. Will do! I’d love your vote regarding a review I just posted. Critics either loved the film or hated it. I wonder what side of the fence you lie?